What if Bruno Richard Hauptman was actually telling the truth about where he obtained the kidnapping money? What if the notorious “16th Rail” was, as some claim, planted evidence? 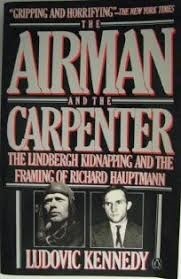 What if Hauptman had nothing to do with the kidnapping and the death of the Lindbergh baby? This book explores the crime, the search for the kidnappers, the arrest, trial, and execution of Hauptman, and the actions of Lindbergh himself. Lindbergh was very much in control of the investigation. The only thing the authorities were able to do was to make the ransom money rather easy to track. Even here they were stymied a bit when JFC, with a stated purpose of saving Lindbergh money, failed to give the kidnapper(s) the portion of the money made up of $50 gold certificates. The $50 bills would have been more easily traced. Was Lindbergh, newly minted National Hero, given so much leeway on the case as to cause an innocent man to go to the electric chair? Was Lindbergh, a proponent of a pure race, guilty of having his child murdered because the child was “a tad slow?” Where was the rest of the money, since Hauptman, a speculator on the stock market, did not spend the cash?